We’re completing two alphabet printing tasks at school, in addition to our stories, brainstorming and other literacy activities. We’ll start sending home one printing sheet every week and the other we are collecting for the children’s Alphabet books which they will proudly bring home at the end of the school year. Attached to it will be the children’s Alphabet craft. You can help your child practise their sounds by posting each craft in a highly visible space such as your kitchen or in your child’s room. Next up: Letter B. 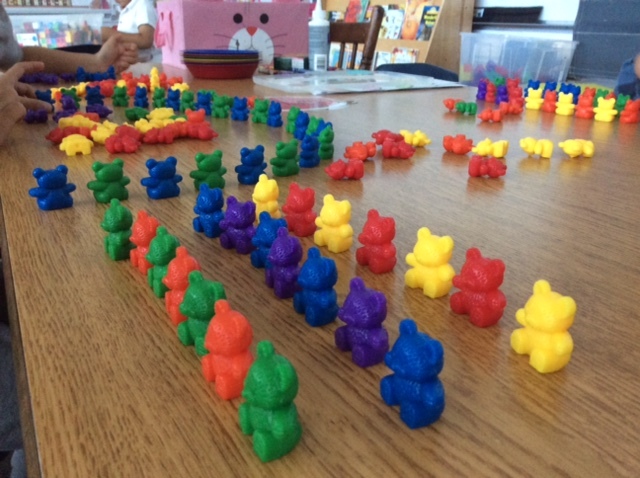 The children have been free exploring the classroom math manipulatives. Now, they are ready to start taking on a few small tasks while working in their small groups. 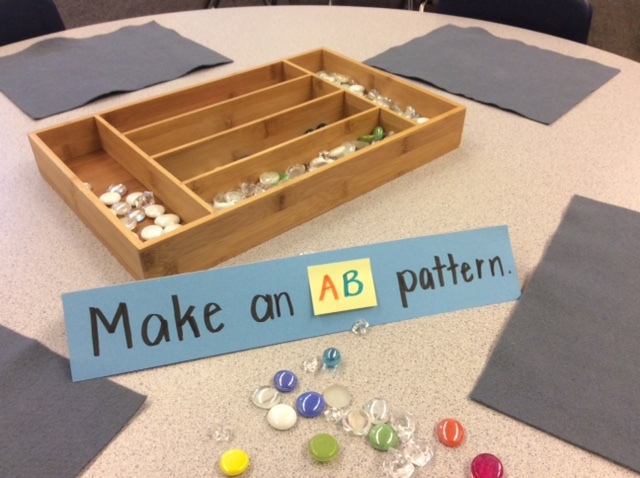 September’s math pattern is AB, so the children have been creating AB patterns at their table groups. The children have been rotating through the five tables, each with a different kind of manipulative. They are extremely creative as you can see from these teddy bear patterns. We also reinforce what we’re teaching in class through our morning Centres time where we will invite the children to apply their skills to a new manipulative. We started an informal round of Special Helper this week without Sharing. 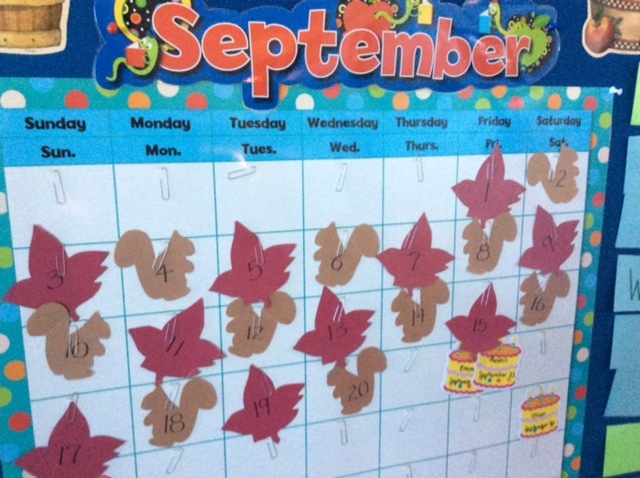 We’ll include Sharing, which always has a theme in our classrooms, after each child has had a chance to be the Special Helper, be the line leader, sit in the Special Helper chair and lead the class through the morning Calendar. The Special Helper rotation is always posted outside our classrooms on the Parent Notice Board. 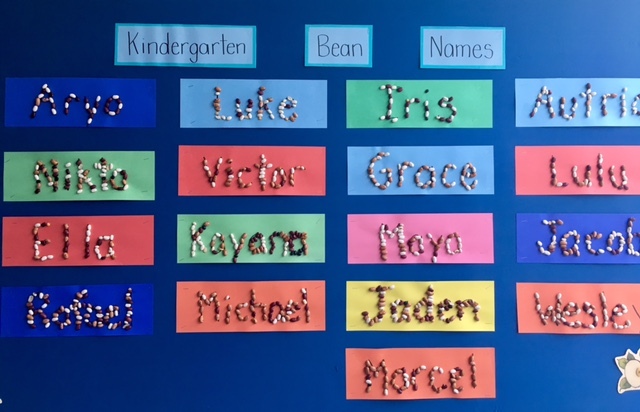 In Social Studies, our focus is on Personal Identity, and we started with making a fun project with our names, Bean Names! We were super impressed with the children’s fine motor skills and perseverance in placing the beans carefully along the glue lines. We encountered quite the rain deluge earlier this week. Please send your child with a coat everyday. We are trying to get into a good habit of at least starting with a coat for the beginning of the morning and lunch recess. We know the children get very warm from running, so they may ask permission from the duty supervisors to return to the classroom with a friend and hang up their coat. We do not want children leaving their coats on the benches or hanging from the playground. Finally, if you’ve not yet sent in an extra change of clothes in a small shopping bag to hang on your child’s hook, please support us in getting these things organised. Thank you to everyone who made a Scholastic purchase. Please return your child’s order form on Monday as we cannot complete the ordering process without it. Your student verification forms and emergency comfort kits are now due. We have many students whose families have not yet completed the Policy and Procedures online forms. This is the online form which gives permission for students to do a walking field trip off the school grounds (Terry Fox Run, events held at WVSS and the Kay Meek, nature walks to Chatwin Park). We receive a daily notice from Mrs. Lytle of which families have not signed off on this requirement. If you are not certain this includes you, please check in with us or at the office. And a form must be completed for each of your children, not one for your family. Tuesday, September 26: Terry Fox Assembly for Primary students. We realise the Terry Fox Run may be new for some students we so will take some time with the other Primary classes to have a short talk about Terry Fox’s courage, his dream to run across for Canada and his legacy for all Canadians. Wednesday, September 28: All West Vancouver Primary students will be participated in our District Physical Literacy Program. We will be gathering a baseline for basic movement skills so each student can work towards a personal goal. Please ensure your child is wearing running shoes to school on Wednesday. Library Book Exchange for both Kindergarten classes. Thursday, September 28: Ridgeview’s Terry Fox Run. The Kindergarten children will be joining up with their Grade 7 Big Buddy to run a lap or two around the gravel field (please note we do not leave the school grounds). First, we will participate in a group warm-up. Then, following our run we will wait on the playground for the rest of the school to complete their off-site run before we finish with some closing remarks from the Grade 6 student organisers. At this time, the draw for the Terry Fox t-shirt will be held. We encourage our children to wear red and white clothing (your Canada Day t-shirts are perfect) and everyone must wear runners. Please remember to bring your toonie for Terry. All proceeds are donated to the Terry Fox Foundation. For donations of $5 or more, students will receive a raffle ticket for the t-shirt draw.